VpCI-325 is a ready-to-use vegetable oil/solvent-based liquid for general purpose corrosion protection in a wide variety of applications. Some of these include protection of sheet metals, wire, pipes, flanges and other fabricated and/or machined parts, guns and a host of other products. 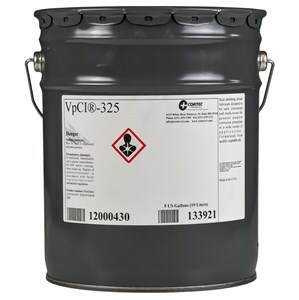 VpCI-325 protects against corrosion and works as an excellent lubricant performs effectively even under the adverse condition of high relative humidity and in the presence of such corrosive elements as chlorides, hydrogen sulfide and other sulfur compounds. VpCI-325 is based on a vegetable derived, biodegradable oil. VpCI-325 forms a film on the metal surface and protects in two ways: first, oil-soluble safe corrosion inhibitors offer a tenacious film which clings to metal surfaces. In addition to this filming barrier, VpCIs (Vapor phase Corrosion Inhibitors) are released into the air above the oil. These vapors condense and form a protective barrier on surfaces not contacted by the liquid product. The combined action provides complete protection for internal system parts. VpCI-325 also provides dependable and complete water displacement from the metal surface to prevent corrosion. VpCI-325 displaces water as effectively as a leading lubricating rust preventative (r.p.) oil while providing much better protection against corrosion. Available in 5 gallon pails (Cortec Product # 12000430) or 55 gallon metal drums (Cortec Product # 12000431). 5 gallon drum weighs 50 pounds and ships under our standard shipping rates. The 55 gallon drum must be shipped by truck. We will provide you with a freight quote before we ship this product. The product should be stored sealed. Agitate bfore each use. VpCI-325 has a shelf life of up to 24 months.